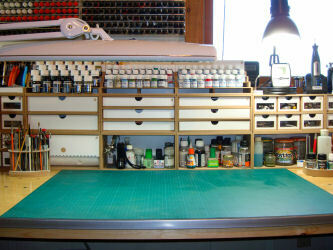 Last March, I decided to take the plunge and transform my hobby workbench using the modules from HobbyZone. You may recall that I wrote about my experiences here. Since that time, I've logged a number of build projects and ran into another problem that wasn't really a surprise. Over the last decade or so, I've used folding tables for my workspace and these were the blown plastic surfaces mounted on metal folding legs that I purchased at one of the warehouse stores. While these served me well and will continue to do so under a less-strenuous role, the weight on my bench was starting to cause some problems. On the table to my left, I had a wooden shelf unit and an old kit-based three-drawer box that stored my supplies, but one day I noticed the shelf starting to lean forward. The weight of the shelf was causing the base to sink into the plastic. Placing a board under the shelf spread the load out across the plastic surface and gave me a few more years of service. More recently, I noticed that the modules where starting to lean forward as the weight of the loaded modules started to repeat that process. I needed a better foundation for my workbench and I found just the solution. If plastic wasn't going to be sturdy enough, wood was the answer. There are a number of wooden tables out on the market and some with metal frames underneath that support the wood top and folding metal legs. Better still, I found wood tables with reinforcing strips along the sides that gave them a weight rating of over 500 pounds (distributed) and I acquired two of them. They are available in a variety of sizes so you can find similar solutions for your workspace. I had originally planned to make the transition of my bench in the middle of last week, but due to other circumstances, my workshop and photo studio were offline for almost a week. Getting started was easy since I could simply pick up each stack of modules and set them safely aside. Packing up the miscellany took a little more time but it also gave me a chance to consider more storage options. Since my original transition to the HobbyZone modules, they've released four new modules and I decided on expanding my workspace using six additional modules and one paint rack. Starting with the center of the bench, I added a new OM13 storage module for a total of three storage modules on the bottom row which makes it very nice to have a place off the work surface to store larger bottles/jars but still have them in arm's reach. One of the other newly released HobbyZone modules is the OM2b two-drawer module which is similar to the OM2 three-drawer modules but has two deeper drawers in place of the three shallow drawers. 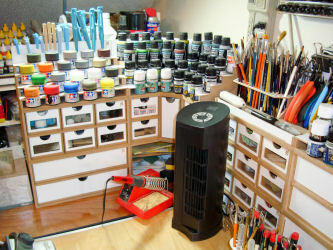 This makes storage better for tools that would not otherwise fit in one of the other drawers as well as storing a larger quantity of items like sanding sticks. You can see one of the OM2b modules over the OM8 paper towel holder on the left. 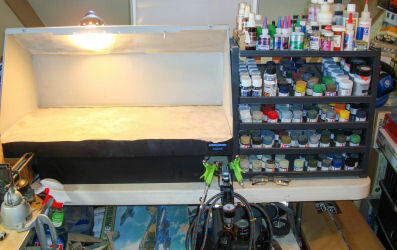 I've also added an OM5u paint shelf next to the existing one to double the storage of my AKAN paints for all of the additional Russian projects coming soon. On the left side of the module array, you can see that these have expanded onto the left table surface now that both tables are sturdy enough for the weight of storing stuff. The left stack has a second OM2b on the bottom, an additional OM1 six-drawer module above and one of the new OM5xb paint racks designed for the larger Tamiya 23ml paint bottles. I do have a gap between the modules at the table edges to run power chords and access the wall-mounted power strip. The black pillar next to my soldering iron is a fan. 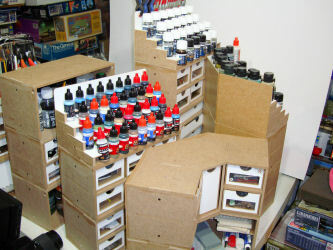 Further left and behind the modules is part of my old storage shelf which is still being used for storage and I've added the S2s paint rack on top to hold more of my 17ml paint bottles. 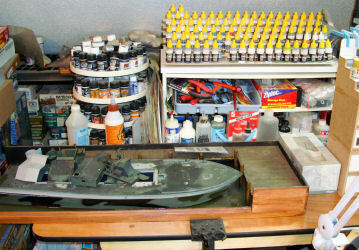 The rotary storage unit is also left-over from before and it holds my weathering materials. I still have a surface left-over for short-term storage, in this case I've got my Italeri 1/35 PT596 back on the bench for clean-up, update, and completion (finally!). On the right side of the module array, nothing has really changed other than the nice solid wood surface. 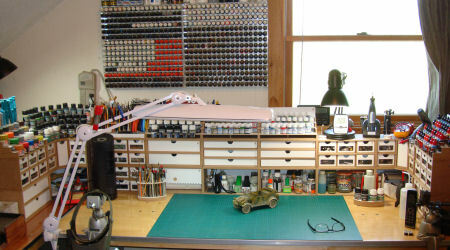 I have moved my airbrush holder and regulator over to the table on the right. Here's the right-side table and you can see the white plastic table surface which may eventually be replaced, but it hasn't had the weight symptoms exhibited by the other two tables. On the left side is my 12-year-old Artogragh 1530 spray booth which continues to work flawlessly. 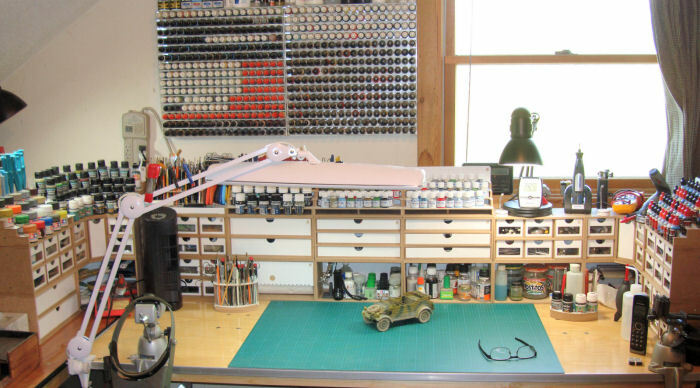 To the right is my paint rack produced by GSI which I acquired a few years before discovering HobbyZone and it holds my Gunze Aqueous and Tamiya paints. So this is my workbench version 3.0 and while everything is still within reach, I have a little more surface area to spread out parts trees as I'm working. One other advantage to the wooden tables is the ability of clamping more to the table edges than before. The white tables are too thick for many types of clamps. While I'm certain there will be more evolution of my workspace as I continue to log more building hours on this bench, I can't begin to express how much easier it is now to keep things clean(er). Where we all tend to use gravity to hold brushes, tools, parts trees, etc. across our work surfaces, I have found it worthwhile to put stuff away at the end of each work session or as I transition from building to painting, etc. Once you get accustomed to where everything is located, it is easier to go there for a tool or whatever instead of rummaging through the pile on your bench. 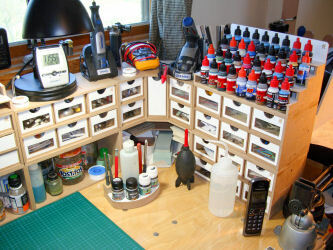 Stop by HobbyZone USA for the latest storage solutions for your own hobby bench!